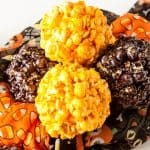 These marshmallow popcorn balls are so easy! And unlike other popcorn balls, these don’t become hard and tacky. They stay soft and marshmallowy! Pop the popcorn and remove the unpopped kernels and partially popped kernels. Add the marshmallows to the melted butter and stir until completely melted. Remove from the heat and stir in the vanilla and food coloring. Pour over the popcorn and stir until all the pieces are well coated. Scoop out into 5 piles onto wax paper. Spray your hands lightly with non-stick cooking spray and press each pile into a popcorn ball. Set the popcorn balls on wax paper and give them about and hour to completely set up.